The primary downside of being a voracious reader and reviewer is that one eventually comes to agree with Qoheleth from the book of Ecclesiastes that there is indeed nothing new under the sun. Take, for example, the recent glut of books arguing of the impending collapse of the American dollar and economy. Perhaps sensing the increasing competition for eyeballs, each author tries to outdo the last with even more apocalyptic outcomes and stringent prescriptions needed to survive the decline of the American Republic. After a dozen or so such efforts, one's enthusiasm for the next can understandably be at ebb. 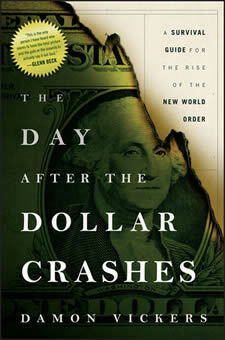 Then comes along something like Damon Vickers' The Day After the Dollar Crashes: A Survival Guide for the Rise of the New World Order, a book so odd that a person could be forgiven for not being sure if it's the product of a genius or a madman. Like most others in this space, Vickers begins with the same premise – that the American economy is so-laden with debt and structural failure points that it cannot help but to collapse – but that merely serves as his beginning. The agenda that he lays out after this sober start is, to be tactful, among the more unique seen. Vickers, who it must be said has apparently been a successful investor for over two decades, dedicates the first half of The Day After the Dollar Crashes with a thorough enumeration of the many issues he feels is confronting the United States. Everything from economic and demographic time bombs to political inertia and an unwillingness to confront the staggering size of the problems is given a going over. It's not anything we haven't read before but it's a message that apparently has yet to be seriously considered by most Americans. Vickers' message is dire and clear: The United States is on an unsustainable and suicidal course that can only end in economic and perhaps even political and societal collapse. So what triggers this apocalyptic scenario? During one of the U.S. government's regular sales of Treasury notes it's shocked to find there are no buyers. For several days the world economy exists uneasily until the inevitable happens and global markets begin a freefall. A little over a week later, he postulates, the world markets is made up entirely of sellers and all trading on exchanges begin to shut down and credit freezes. Within a month, as the wealth of rich and poor alike is wiped out, violent social unrest begins to manifest itself on American streets and soldiers fire upon protesters and looters – resulting in the deaths of thousands. The IMF/G20 responds by taking over the global economy and imposing a new international currency. Had Vickers ended The Day After the Dollar Crashes with this horrific picture it would have served as a warning to a profligate and irresponsible America to begin putting its financial house in order and expect responsibility from both the public and politicians alike. Instead, Vickers charges into describing what he expects from the New World Order that will arise out of the chaos of global meltdown. This NWO, he argues, will see a new Central Government (CG) charged with protecting the rights of citizens and the planet. It will simultaneously be a limited government yet powerful enough to intervene on any threat perceived to economic, ecological, political, societal and personal issues. Nationalism will be wiped away as borders become immaterial but the CG will also be charged with protecting cultural identities. Free markets will reign but the CG will guard against anything that smacks of exploitation. Not content with recasting the world politically and economically, Vickers also argues for a new age-y transformation of humanity itself which should make the so-called alternative health care and organic farming industries, the environmental movement and the city of San Francisco pleased. Virtually every scientific advance – such as the Green Revolution – which made it possible to feed billions on this planet is to be rejected, consumers need to boycott fast food until organic juices are sold and the health care industry needs to be recast into a new and more rational entity – be it government-mandated or not. It's difficult to encapsulate Vickers' agenda because there doesn't seem to be a cohesive ideological or philosophical framework to hang it on. Depending on where someone randomly opens The Day After the Dollar Crashes and begins reading, Vickers could sound libertarian, conservative, liberal or leftist. He preaches limited government and ground roots action but several of his prescriptions could only come from an activist and overreaching government. And while his economic credentials are fairly solid, his assertion that a new CG would reset the global economy after debt blows everything up sounds more like Tyler Durden's agenda from Fight Club then the inevitable third world war that would probably erupt. Many authors have attempted to tie their personal agendas to America's economic issues – whether it's a return to a traditional morality or a push for a more activist government – but Vickers has to be lauded for advancing one of the more confused. That doesn't mean that The Day After the Dollar Crashes is a total loss as the first half is a generally compelling and reasoned argument that the course America has charted can only lead to catastrophe and ruin. The second half, however, does little to address those issues and instead seems like an effort to push Vickers' own scattered thoughts as the natural evolution of humanity after what seems like the inevitable economic collapse.